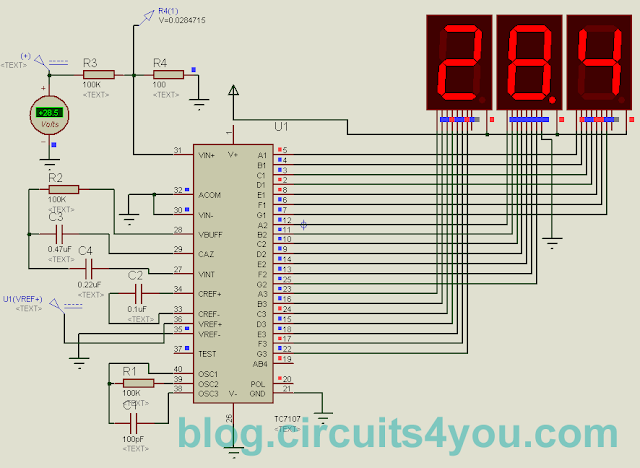 The circuit given here is of digital voltmeter with LED 7-segment display using the ICL7107. It measures voltage from 0.00V to 99.9V. ICL7107 is a 3 1/2 digit A/D converters with LED 7-Segment Driver. The Intersil ICL7106 and ICL7107 are high performance, low power, 31/2 digit A/D converters. Included are seven segment decoders, display drivers, a reference, and a clock. The ICL7106 is designed to interface with a liquid crystal display (LCD) and includes a multiplexed backplane drive; the ICL7107 will directly drive an instrument size light emitting diode (LED) display. The ICL7106 and ICL7107 bring together a combination of high accuracy, versatility, and true economy. It features autozero to less than 10μV, zero drift of less than 1μV/oC, input bias current of 10pA (Max), and rollover error of less than one count. True differential inputs and reference are useful in all systems, but give the designer an uncommon advantage when measuring load cells, strain gauges and other bridge type transducers. Finally, the true economy of single power supply operation (ICL7106), enables a high performance panel meter to be built with the addition of only 10 passive components and a display. using 1/2(half) display. Reference voltage of 100mV is generated using 1.2 V Zener and Variable resistor forms a voltage divider. Input is divided by 100K and 100Ohm resistor to get 200mV in-proportion. A 0.1μF capacitor gives good results in most applications. However, where a large common mode voltage exists (i.e., the REF LO pin is not at analog COMMON) and a 200mV scale is used, a larger value is required to prevent roll-over error. Generally 1μF will hold the roll-over error to 0.5 count in this instance. The analog input required to generate full scale output (2000 counts) is: VlN = 2VREF. Thus, for the 200mV and 2V scale, VREF should equal 100mV and 1V, respectively. 1. Comment if you have any questions. I want to use this circuit to measure temperature, by connecting an LM35DZ sensor. What would be the changes and calibrations needed? great post. Good to know about this digital voltmeter circuit as well as the 31/2 digit A/D converters. Easy task and effort. Thanks for the post. Hola una consulta de cuanto es el valor del trimmer o resistencia variable que conectaste en el circuito ?